Feel several countries' cuisines by eating Shippoku ryori! Shippoku-ryori is Japanese traditional cuisine in Nagasaki prefecture. It was made of Japanese dishes and foreign dishes, Chinese, Dutch and Portuguese cuisene. Several people sit around a red round table, and eat dishes on a platter in this cuisine. 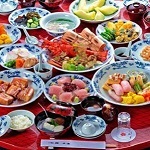 Many Japanese are surprised that because Japanese ate dishes on the mini own table in the past. Shippoku-ryori was born in Nagasaki when Chinese traders came and stay there in the begining of Edo period(1603-1868). Shippoku-ryori is deeply involved wtih Nasagasaki's history as the only port for Western countries and China under the isolationist foreign policy by Japanese government of Edo period. People saw and trade with foreign visitors, Chinese, Dutch and Portuguese, only in Dejima which is an island of Nagasaki. People in Nagasaki were influenced by foreign cooking and dishes despite isolationist foreign policy. They mixed Japanese dishes and foreign dishes into Shippoku-ryori. It was established as home cooking for guest, but it became one of the Japanese party dishes before they were aware of it. It is said that it is one of the local Kasaiseki-ryori. Nowadays, many people lives in Nagasaki eat Shippoku-ryori on a special day like wedding. 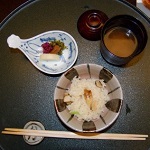 On the other hand, many tourists visiting Nagasaki eat it in the restaurant called Ryotei or Kappo. Shippoku-ryori's menu varies by resutaurants and course though the below menu is standard. Some restaurants removes some dishes depending on course, but most restaurants serve Ohire first at a course meal. Ohire is a clear soup with bream after serving aperitif. A pasty also called Basty or Bastera in Nagasaki appears in Yakimono or Obachi. It is a very famous dish of Shippoku-ryori. It is different from pasty of UK in soup. Japanese pasty is roasted pie sheet on the Japanese soup, customers eat it with dipping pie into soup. It is similar to pot pie stew rather than pasty of UK. It is said that its origin is PASTA in Portuguese. In addition, a deepfried bread within minced shrimp called Hatoshi in Japanese is also famous dish of Shippoku-ryori. It is made by influencing Chinese dishes. There are many restaurants to eat Shippoku-ryori in Nagasaki, but there are few restaurants to eat it in Tokyo, Osaka and Fukuoka. Hus Ten Bosch and Hidden Christian Site are very famous sightseeing spot of Nagasaki. Hidden Christian Site of Nagasaki was recognized as the UNESCO World Heritage Site in 2018. If you have already traveled Japanese famous city and spot, it might to be a good idea to go Nagasaki. You can experience Japanese culture through Shippoku-ryori.